Merlin, Stitched in Time: Happy Halloween! This makes it two posts in a week! I blame Halloween and the fact I have power here. So important. I also finished a Historical Sew Fortnightly Challenge! EARLY! Yes I am quite young in this shot. A senior in high school. Note the long sleeves, the slight bustle and the train. I never like how the skirt fell. It didn't have enough weight. 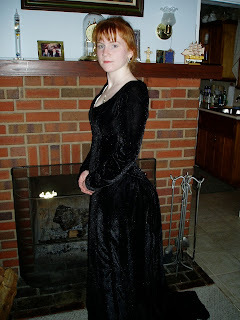 I then made a new bodice to this posted in a post a year ago. But this would be the skirt with the new bodice. I still need to adjust the bodice for this look, but the cape shows up later. It's so pretty. With silver moons and stars on the tulle. So last year I got it in my head that I needed to repair the skirt, line it with something. I bought several yards of black cotton broadcloth, took apart the skirt, laid it out and cut out the lining. The next part should be easy. It was until I ended up with a wicked headcold that left me unable to look down. I got better and then we lost power. Damn you Sandy. I tried stitching by candlelight which failed miserably. So I put it aside. This year I was motivated and on October 28th, I tore out seams and redid the skirt, did crash course research and made an Order sash, and removed the sleeves from the original bodice. Throw in Catwoman's velvet gloves, some pretty pins, and sparkly jewelry and you get the Queen of Darkness in Court Dress. Upon taking these pics I realized for this type of dress, I should be in a tiara. I don't currently have one for the Queen. For now her Bat headpiece will have to do. She is much pleased by her cats and her throne. You can see two in the pictures above. (the black one refused to be photographed from anywhere but the stairs. Pattern: Originally from “Patterns for Theatrical Costume”, there was a lot of research about court attire. How Historically Accurate: It looks historically accurate. But it’s really not. There’s a zipper in the back of the bodice. And it was never meant to be historically accurate. 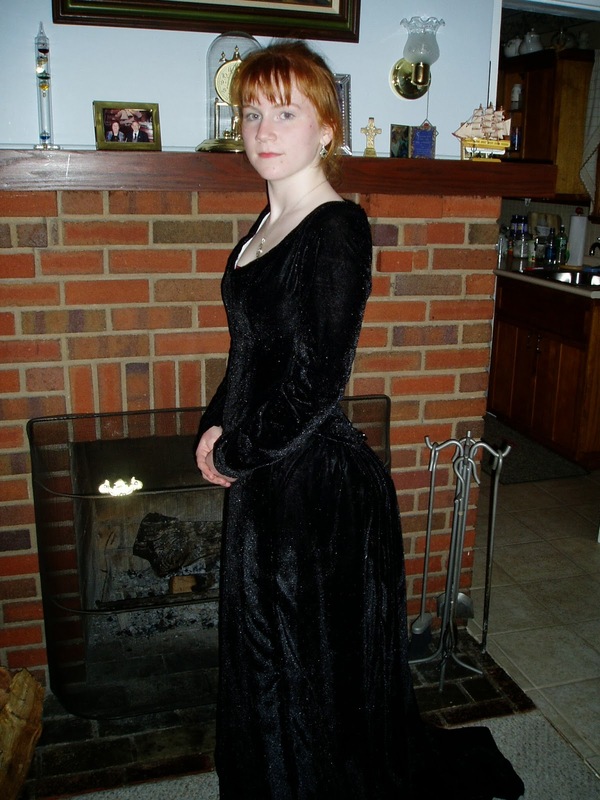 Hours to Complete: I originally made the bodice and skirt 6 years ago. Started the skirt redo last Halloween, got sick, Sandy came. Finally finished. Maybe three or four working straight. Total Cost: Um….maybe $50 overall from the beginning? Fantastic gown! You must have been the best dressed around where you lived! If only 'twas acceptable to wear out....Next year there shall be a party.